Many people believe that radioactivity is all man-made, whether it be made in laboratories, nuclear power plants or nuclear explosions. This is entirely wrong. Since the Earth formed, along with the formation of the Sun and the other planets and moons about 4.6 billion years ago, both it and everything on it have been radioactive to a certain extent. In the distant geological past, the Earth was even more radioactive than it is today. The Sun and the Earth were made from the debris of supernova explosions, in which all the elements of the periodic table, including radioactive isotopes, were created. We are actually made of (slightly radioactive) star dust. Radioactivity is a natural ingredient of all life forms and also of the air that we breathe and the food that we eat. In addition, we are constantly being bombarded by cosmic-ray particles which mainly come either from the Sun or from other sources within our galaxy. These particles constitute a low-level radiation exposure. 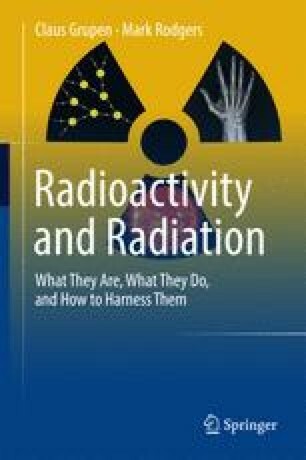 In the following chapter, the different natural sources of radioactivity will be presented in detail and compared with additional man-made radioactivity. Radiation exposures from the natural environment come from cosmic rays, radiation from the ground (terrestrial radiation) and the incorporation of radioisotopes from the natural biosphere. Normally, the three doses are of broadly similar size (with the dose from incorporation being a little higher). The exposure due to technical equipment and installations has its origin almost exclusively in medicine (diagnosis and therapy). As regards its effects, there is no difference between ionising radiation from natural sources and ionising radiation from technical installations.